Discover a spacious elegant hotel when you check in to Hilton Houston Westchase. Conveniently located off the Sam Houston Tollway and Westheimer Rd in the heart of the Westchase business district this west Houston hotel is located 30 minutes from both William P. Hobby-HOU and George Bush Intercontinental-IAH airports. The hotel offers easy access to Energy Corridor City Centre Galleria Downtown and is close to corporate businesses such as Chevron Schlumberger Phillips 66 Cameron and National Oilwell Varco. Enjoy panoramic views of Texas* biggest city with floor-to-ceiling windows in all the Hilton Houston Westchase hotel*s guest rooms. Upgrade to the Executive Level and enjoy the lounge amenities including a separate business center and conference room. PURE hypoallergenic rooms are available. Relax in our accessible rooms featuring roll-in showers and thoughtfully sited switches and outlets for comfort. All guest rooms are designed to maximize comfort while suites are airy and spacious. 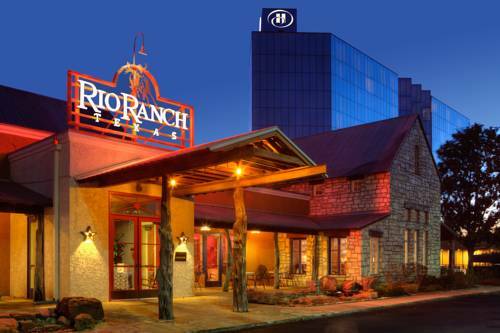 Mesquite wood-grilled steaks are our specialty at the award-winning Rio Ranch restaurant. Relax by the 30-foot limestone fireplace created by Texas artisans and enjoy the authentic Texas Hill Country atmosphere during breakfast lunch and dinner. Retire to the Rio Ranch Saloon or Lobby Bar adorned by glass skylights for cocktails entertainment meeting colleagues or to watch your favorite game. Located on Westheimer Road our west Houston hotel is nearby the world-famous Galleria Mall. Texas* most popular shopping mall and the 7th largest mall in America. Anchored by Macy*s Saks Fifth Avenue and Nordstrom the mall features boutiques by some of the most prestigious names in fashion including Jimmy Choo Armani Chanel Bvlgari and Louis Vuitton. Hilton Houston Westchase welcomes our furry friends as a pet-friendly hotel. Nearby Memorial Park lets the whole family burn off energy with nearby hiking trails tennis courts softball fields and an 18-hole golf course. In room dining at its finest. Menu items reflect the tastes of the southwest. - ABB LUMMUS GLOBAL INC. Impressive collection of caskets, hearses, and funeral industry regalia, including JFK's original Eternal Flame, Truman's embalming machine, and a waxy Pope and Lincoln lying in coffins.